Dance, like music, is a language that all people speak, and participation in this event shows you care about others in our community. 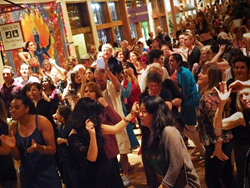 The Amma Center of New Mexico announced that its annual Bollywood Club Invasion fundraiser - Santa Fe’s best dance party - will be held Saturday, April 30, 2016, from 6:30 pm until midnight at Sanbusco Market Center. Proceeds will benefit multiple Amma Center of New Mexico local relief initiatives including The Burrito Project, which offers free vegetarian meals to more than 108 homeless or needy individuals in Santa Fe every Sunday. The Burrito Project has prepared and served over 100,000 burritos since 1996, in addition to sponsoring and preparing meals for St. Elizabeth’s and Casa la Familia shelters. This year’s Bollywood Club Invasion, featuring its signature Bollywood-inspired live DJ mixes, dancing and vibrant entertainment, returns to Sanbusco Market Center located at 400 Montezuma Avenue in Santa Fe. Celebrated local favorite DJs Dynamite Sol and Aztech Sol, along with DJ Shobanon from San Francisco, will fill the evening with alluring eastern and western dance rhythms. Agramzu’s dazzling multi-media display featuring Bollywood dance video clips will inspire fun on the dance floor. The charismatic and popular Bollywood dance performer Jaymin Patel, will kick off the event at 7:00 pm with a live performance and at 7:30 will lead event participants in authentic Bollywood dance moves. Additional performances will be held throughout the evening by the highly talented Myra Krien and the Mosaic Dance Company’s Pomegranate Dancers, as well as by Jaymin Patel and Whitney Jones, who will team up to present a dynamic duet. The evening’s festivities are enhanced by a variety of fun activities including a colorful Indian-inspired clothing bazaar. Astrology readings, chair massage and hand henna tattoos can all be purchased. There will also be a plentiful array of sumptuous food, desserts, and traditional Indian chai for sale. When the doors open at 6:30 pm, event participants are welcome to shop in the bazaar, enjoy the refreshments, and purchase an astrology reading or henna tattoo before the dancing begins. Admission at the door is $15 per person ($7 for children under 12 years of age). ‘Like’ our Facebook page at http://www.facebook.com/BollywoodClubInvasion to stay connected to Bollywood Club Invasion Dance Party news and updates. Established as a non-profit organization in 1993, the Amma Center of New Mexico operates under the umbrella of Embracing the World, an international NGO serving a collective of charities founded by renowned spiritual and humanitarian leader, Sri Mata Amritanandamayi. To learn more about Embracing the World and its regional projects, visit: http://www.embracingtheworld.org.